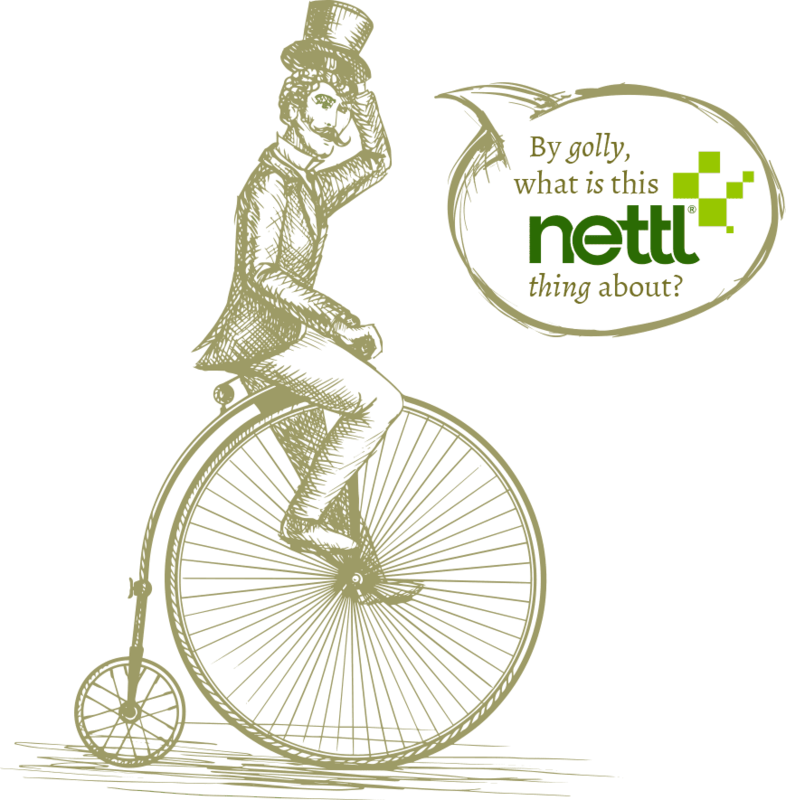 JUST WHAT IS A ‘NETTL’? It’s not even a plant. It’s the largest network of neighbourhood web, print and design studios in the uk. We’d like you to be a part of it. We always think that’s a wise place to begin. In the old days, clients invested their marketing budget on print-based advertising. Nowadays, the first thing a start-up business wants is their website. Business cards aren’t first anymore. Then, that startup needs help with email marketing and search engine optimisation. So that’s where Nettl starts too. But it’s certainly not where it ends. It’s not that clients don’t buy print anymore. It’s just that the creative relationship starts with the person who designs the first thing. Since that thing is often a website, the relationship now starts with their web designer. Admit it. You’ve probably cursed the web guy who sent you a 72 dpi RGB logo to print. Well, now those files are being uploaded every day to online printers. You might be wondering how we know all this. You see, we were once the printer. Of course, we came up with clever creative. And we made magical marketing. But print was our DNA and we had a network of print stores, sprinkled all around the globe. Gradually, clients stopped coming in. Things got harder. Our margins eroded. HOW DOES NETTL HELP CLIENTS? Clients don’t want multiple creative relationships. They hate explaining their brand to a sign guy, a web girl, some expo dude and then a printer. They want one person to take care of it all. But life is complex. All of those things are hard. Nettl makes it easy to navigate. We simplify. We cut out the jargon. Ten years ago, a website was just a homepage, about us and a contact form. Then clients started wanting to do more. To take payments. To sell things online. On the move. On mobile devices. With stock sync’d to their back office system. Put up online appointment booking forms. With live availability of time slots. And that’s when things got more complex. Spoiler alert: Nettl does all this and more. WHERE DO I COME IN? Maybe you’ve done a little web. Perhaps you’ve sold absolutely loads. Or it might be you’ve done none at all. It doesn’t matter how experienced you are. Nettl helps graphic professionals – like you – to win and make profit from web projects. It helps them deliver small projects, profitably too. With classroom training and smart software. And of course, a little secret sauce. They want to push the boundaries. After all, they’re entrepreneurs and want results. But before you can quote for their web project, you need to know how to do it. Else it could take days more than you quoted. And figuring how to, takes time. Time that clients aren’t paying for. That’s where the Nettl Geeks come in. The Nettl Geeks build Fast Paths. They’re the blueprints for the how tos. Because every business type has common needs. Stores want click + collect capability. Financial advisers yearn for mortgage calculators. The Nettl Geeks work out how to. And they create digital recipes, called Fast Paths. Your team can follow and edit these recipes. And get a known outcome for a known price. Sometimes things don’t always go to plan. You get stuck. Something doesn’t behave. You need a bit of code to make that thing work. Maybe you’ve found a new problem. Surely someone has tackled the same thing? That’s where the Geek Channel comes in. It’s a private global community. All our Nettl Geeks and partner network. Ask a question on there and get help. Friends don’t let friends get stuck. SO IS THIS JUST A WEBSITE BUILDER? Oh, my. Oh no, it’s not. Nettl is so much more than websites. The journey might well start with a website. But it could also start with exhibition displays. Or a request for some business decor. Nettl covers a full range of marketing collateral. With product supply chain hooked-in. Fancy print. Fabric displays. Promo stuff. And a smart cloud-based, management system to handle multiple projects going on at one time. Yeh, we think so too. You just want to get the job done. We’ve developed our software over two decades. So we’ve learned a thing or two about how to save a few minutes here and a few hours there. The Nettl back office connects you to clients. Online payments. File uploads. Proof approvals. All the self-service things they want to do. It intelligently automates lots of little tasks. Like billing. Subscriptions. File preflighting. It makes your team work more effectively. You spend your day working up ideas for clients. Do you promote yourself as much as you’d like to? It’s like the builder’s own unfinished house. Clients always take priority. Of course they do. Sometimes that means we don’t do all the things we wake up with the best intentions of doing. Nettl is a full suite of marketing, to help you sell. Online and offline. E-shots and Brochures. In-store, direct mail and for exhibitions. In a friendly voice, saying new stuff each time. A reason to contact clients and win new ones. So, we know you’re famous in your town. Your business was built on your reputation. So how do we work together? Nettl is a bolt-on partnership. That means you keep your existing brand. And you co-brand Nettl with it. Use as much of our funky brand as you like. But please know this. The Nettl system and marketing is not available as white-label. It’s a reasonable thought. Growth needs resources. But throwing people at a problem isn’t the answer. Nine ladies can’t make a baby in one month. Sometimes it’s about being smarter. A cheetah is the fastest animal on the planet. Until you give a human a bicycle. And that’s the thing, you see. Nettl helps you get more from your team. It uses your designer’s existing skill set. And amplifies it. Turns it to eleven. Much less than you might think. And far less than hiring a new person. Nettl partners pay from £299 per month, depending on the size of their territory. There’s a one time set-up fee of £4,995. The set-up fee grants geographic exclusivity. It includes classroom training and your marketing starter pack. Everything you need to get going. We’d like to show you the Nettl system in person. We can do that face-to-face, or by webex. or call 0800 211 8060 to arrange. Alternatively, fill in the enquiry form below and we’ll get back to you. All prices exclude VAT and are subject to change. Brand logos and trademarks are property of their respective owners. Nettl partners with printers, web agencies, graphic designers & signage businesses. Our partner businesses vary in size, focus, location and experience. What they have in common is an in-house graphic designer, the ambition to do more and the drive to succeed. Meet some of our fine partners and learn what inspired them to join.